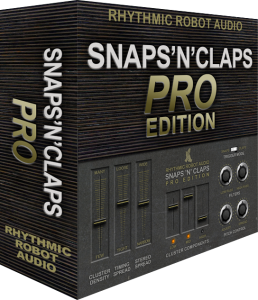 Since we started Rhythmic Robot, Snaps ‘n’ Claps has become one of our best-loved instruments. It seems that everyone needs some fingersnaps or handclaps every once in a while, and our original Hippie In A Tin™ is just perfect for dialling them up quickly and simply. But what if you need more control – over the sound of your snaps ‘n’ claps, or their precise timing in your track? What if you want to tweak them more specifically to the groove you’ve got in your head? Snaps ‘n’ Claps PRO is the answer. We’ve taken the original hippies that fuelled Snaps ‘n’ Claps, and put them through a rigorous boot-camp workout to instil some discipline and work ethic into those flower-power slackers. Only the strongest have survived. The result is an entirely new instrument, created from the ground up with new samples and a far greater degree of user control. Instead of predetermined clusters of sounds, Snaps ‘n’ Claps PRO lets you build those clusters from individual samples – which can be spread out in time to a greater or lesser extent to allow for tight or loose grooves, manipulated across the stereo field, filtered, and adjusted with random pitch variation, to create extremely flexible and customisable beats. These samples are entirely fresh, recorded in an anechoic chamber to allow you to add your own ambience or reverb within the mix. You can take control of how many virtual hippies are snapping their fingers or clapping their hands at any one time, and allow them to be laid-back or precisely focused in their attitude to the beat. You can select from low, medium and high claps and snaps, generated from different hand sizes and snapping / clapping techniques, mixing the proportions of these in your clusters to your taste for a very convincing group sound. The results can be further adjusted to sit perfectly in the mix, with low- and high-pass filters to take out unwanted frequency ranges or to add automated effects. By combining the Timing Spread, Filter and Variation controls, you can either dial in very natural, expressive, non-repeating parts; or create quite unnatural, robotic, almost synthesiser-style sounds suitable for more electronic styles of music. In short, you now have the depth and breadth of control to take your snaps ‘n’ claps to the next level. Snaps ‘n’ Claps PRO retains the funky sound of its little brother but applies studio-grade levels of control to that sound. We like to think of it as the equivalent of having a room full of hippies at your disposal, and the electric cattle-prod necessary to get them doing exactly what you want. If you care about your groove, this is what you’ve been waiting for. A hint for using Snaps ‘n’ Claps PRO: Because the clusters of sounds recorded in Snaps ‘n’ Claps PRO inevitably trail the beat somewhat – they’re spread out in time, and they have to spread after the beat at which you play the note – it can really help to tighten the feel of the groove if you tweak their timing after recording them. Once you’ve recorded (and, if you wish, quantised) your Snaps ‘n’ Claps PRO patterns, select them in your DAW and very slightly nudge them ahead of the beat. That way the mid-point of the cluster will be brought on to the beat and the overall groove will tighten up hugely. A whole roomful of hippies clapping and snapping their fingers on cue! What’s not to love? If you’ve ever tried to get enough people in a recording studio to clap in time or mic up snapping fingers, so that it sounds convincing, you know that you can waste a lot of time to get something that is ultimately lame and unusable. Spare yourself the stress and blood pressure. This handy little gadget is all you need to make your track swing. Perfect and simple. Very clean samples that add some liveliness to anything you want. I was a bit skeptical at first, but this is very realistic. I used it immediately and love it! Very well done. You can control everything of these claps and snaps … crafty and useful! Great emulation. Love the way you can spread it across the sterei image. Great sounds and easy to use! Nice work! Super fun and easy to use. A couple tweaks and the clappage and snappage begins! You know, there is a whole lot of free snappage and clappage out there in internet land, but, bizarrely, considering the ostensibly simple nature of the beast, there is something a bit rum about most of them: They don’t sound like snaps and claps when you get them into your song! Also, they are wave files of varying quality that have to be tediously dropped into the timeline of your track. Consequently, until this instrument was added to my arsenal I used to record all my own snaps and claps song by song and, though they sounded fine, it took a great deal of fiddling about due to my shoddy timing. This little beauty has put all that nonsense behind me. I dial it up almost every time I fire up the DAW and it never fails to provide the right timbre and subtle natural sounding variety to be completely convincing. If a track needs a natural, rather then mechanical, clap or finger snap sound, it often has to sit forward in the mix with some air around it (I can hear “King of the Road” in my head right now), so it has to be good enough to stand there bare-assed and proud, “naked as a jay bird”. This is. You would think this is very limited, but you can adjust from a single snap or clap up to a big group of snappers & clappers, and make the group tight or loose. We are doing a song right now where there is one chorus that drops most instruments and takes a more “intimate” tome- and claps replace the drums for the soft section- which makes the return of the other instruments more intense when we take it back up a notch or two or ten, Very useful. All the instruments that Rhythmic Robot produces are top notch, and superior to similar stuff from competitors, but at a much more reasonable price. It allows me to produce high quality sounding music without having to mortgage the house. 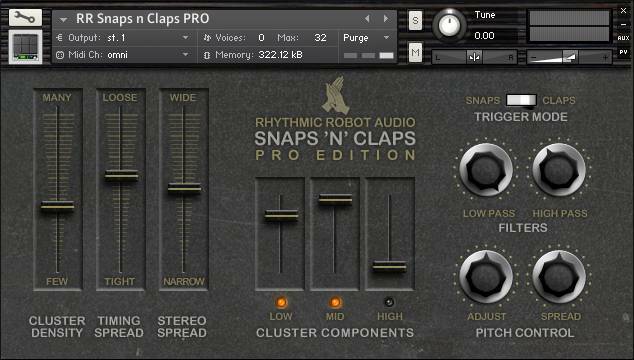 I own quite a few RR instruments, but I find Snaps ‘n’ Claps Pro is a particularly useful instrument, especially for folks like me that do most of my production work alone. It saves a lot of wear and tear on my hands, and a lot of time, by not having to do multiple takes of claps and such. Keep up the good work, I’m a fan for life. Really the best claps and snaps you can buy. It is really hard to record such a good sound.